The DoorBird D2101IKH is an IP video door intercom with a built in numeric keypad and RF reader for access control applications such as gates or entrances. It also has a built in 3.5 inch information display. The D2101IKH allows the home or property owner to receive a push notification on the free iOs or Android DoorBird app when the call button is pressed or when motion is sensed. Tenants and homeowners can answer the door from anywhere in the world just as easily as if they were home. Set up multiple users and individual user schedules to allow access via PIN code or RF fob. When access is granted, the built in relay can trigger a gate, door, or door strike. Doorbird users can proactively check live video, listen in or choose to have a two way voice chat with the visitor or intruder. The built in high definition colour video camera captures amazing high definition 720p colour video during the day. When it gets dark it automatically switches to night vision mode with night vision provided by the built in infrared LEDs. 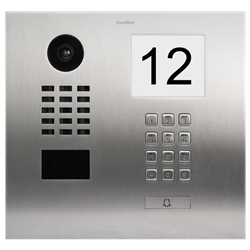 The built in keypad and RFID reader can be used with Doorbird access cards to allow tenants/users to automatically unlock a door or open a gate, or trigger an even by simply presenting their credentials to the DoorBird intercom.